There are a number of animals found in Princeton Landing that are active at night and sleep during the day. These animals are called nocturnal. They have highly developed senses of hearing and smell and especially good eyesight at night. Our Nature Guide Jon Latimer discusses two of them — skunks and raccoons. "Everyone knows when a Striped Skunk has been around, even though they may not have seen it. The evidence of a skunk's presence often lingers long after it has departed. But a skunk's strong scent is only released when it feels threatened. There is no problem when it is left alone. "About the size of a housecat, this beautiful mammal is black with a white V beginning at the top of its head and dividing into two white stripes along the sides of its body. The length and width of the stripes vary, and the bushy tail may have a white tip. "A Striped Skunk spends the night feeding on mice, eggs, insects, grubs, berries and carrion. At sunrise it returns to its den, which may be a burrow in the ground, under a building or boulders, or in a wood or rock pile. Males live alone, but several females may share a den. Striped Skunks do not hibernate and may appear on warm nights during winter. A litter of five to nine young are born in early May. They may been seen in late June or July following their mother in single file. "The Raccoon has a reputation for cleverness. It is known to open garbage cans and unlock screen doors. 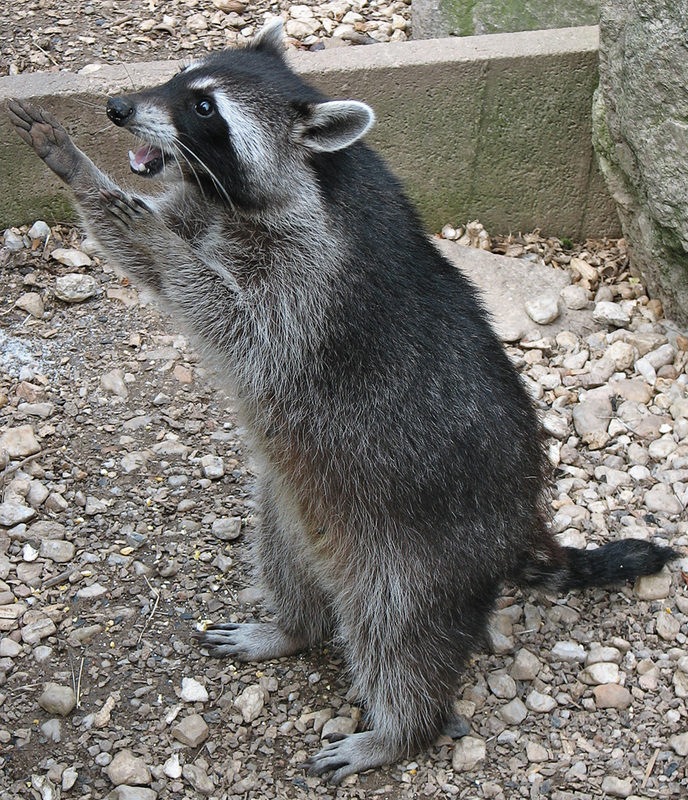 Often a raccoon will stand on its hind legs to examine objects with its dexterous front paws. It is even known to dunk its food in water before eating it. "A raccoon's most distinctive markings are its black "bandit's mask" and the alternating light and dark rings on its tail. Its body fur is a gray mixture of salt and pepper hairs. 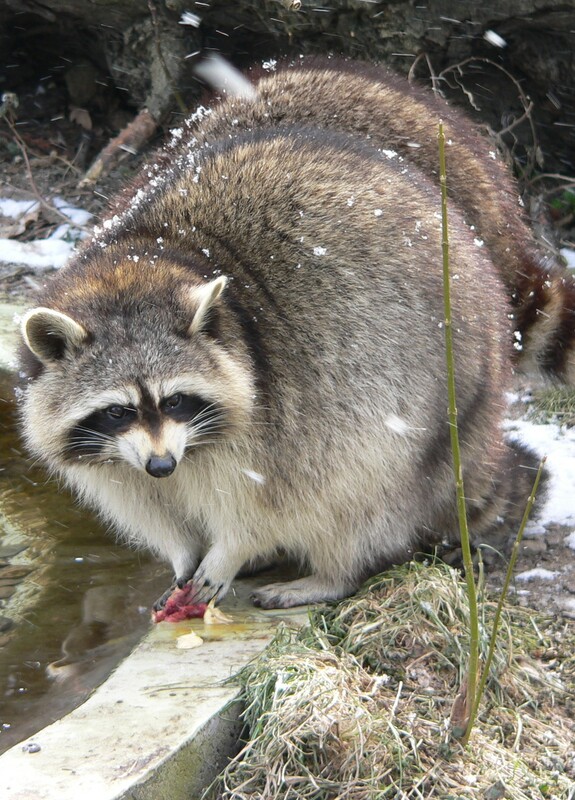 Raccoons eat almost anything, from fruits and nuts to insects, frogs and fish. In autumn they eat voraciously to buld up fat needed for winter. An adult can reach a weight of 30 pounds. "During cold spells in winter raccoons stay in dens in hollow logs or rock crevices, but they do not hibernate. Their young are born in May or June and stay with their mother until fall. She uses a low twittering sound to reassure her young and growls or snarls to indicate anger."